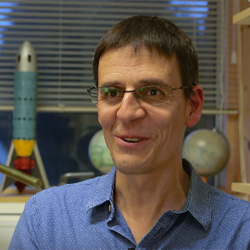 In 1995, in Geneva, PhD student Didier Queloz discovered a planet orbiting another sun – something that astronomers had predicted, but never found. Today he continues his terra hunting for extreme worlds and Earth twins in Cambridge. We are constantly surprised by the diversity of the other worlds. When the numbers began to filter through from the spectrograph that was measuring small shifts in light from distant stars, Didier Queloz at first thought they were wrong. He certainly didn’t think he’d discovered an exoplanet. He checked and re-checked. 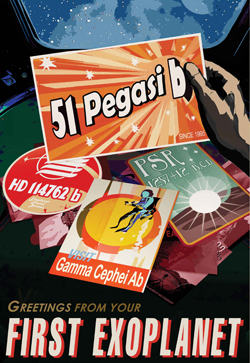 Today, many regard the discovery of 51 Pegasi b by Queloz and Professor Michel Mayor at the University of Geneva in 1995 as a moment in astronomy that forever changed the way we understand the universe and our place within it. It was the first confirmation of an exoplanet – a planet that orbits a star other than our Sun. Until then, although astronomers had speculated as to the existence of these distant worlds, no planet other than those in our own solar system had ever been found. Of the 1,900 or so confirmed exoplanets that have now been found – a tenth of these by Queloz himself – many are different to anything we ever imagined, challenging existing theories of planet formation. Fifty light years from Earth, the exoplanet 51 Peg resembles the gas giant Jupiter. But unlike our distant cousin, which is located in the further reaches of our solar system and takes 10 years to orbit the Sun, 51 Peg ‘hugs’ its sun, orbiting every four days. It’s been hailed as an example of a whole new class of ‘roaster planets’ or ‘Hot Jupiters’ and has prompted scientists to wonder if large planets are able to migrate closer to their suns over millions of years. But, as yet, no planet has been discovered that could be considered a twin of our own. “We are finding planets of a similar size and mass to Earth but nothing at the right temperature – so-called Goldilocks planetary systems in the habitable zone close enough to the sun to be warmed by it but not so close that the presence of water and life is a sheer impossibility,” explains Queloz. “Of course the question everyone would like to answer is whether there is life out there, because we are curious and we can’t resist – it’s how we are,” says Queloz. It’s not possible to see an exoplanet directly – it’s far too close to a blinding source of light, its star – so astronomers use two techniques to look indirectly. Focusing on a star, they use NASA’s Kepler telescope to look for the dimming of starlight as the planet transits in front of it. From this, they calculate the planet’s size and temperature. Current technology works well for finding large exoplanets but to find planets the size of the Earth in the habitable zone astronomers need to look at smaller stars, and they need to overcome ‘stellar noise’, or natural variability in the data caused by physical motions of gas at the surface of the star. As techniques improve and with the launch of NASA's James Webb Space Telescope, astronomers will be able to ask whether what we understand as the basic molecules of life – carbon, oxygen and hydrogen – are present in the atmosphere of exoplanets, opening up the possibility of understanding their astrobiology and geophysics.